I just returned from a recent trip to Guernsey in the Channel Islands where I'd been invited to give a talk about bass fishing to members of GBASS - a group of keen anglers who spend their time fishing in the productive waters around the Island. Of course it was pretty obvious that there would be differences in our approaches because here in Dorset my maximum tidal range isn't much more than a couple of metres while the difference between low and high water in Guernsey can be ten metres or more, so I expected to have my eyes opened a bit. Even so I was surprised to find that although there is a huge overlap in our tackle some of the tactics were as different as chalk and cheese. Andy Hockey, who arranged my trip and looked after me while I was there, was a mine of information showed me a lot about how they tackle their fishing. 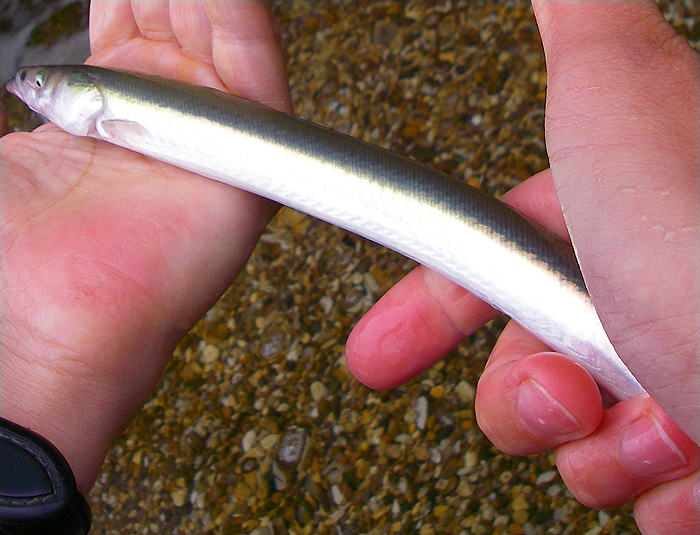 Of course, just as here in Dorset, there are anglers who favour lures and others who fish with crab, squid or mackerel on bottom gear but the thing that really impressed me was the knowledge and dedication that some of the anglers have applied to freelining sandeels. 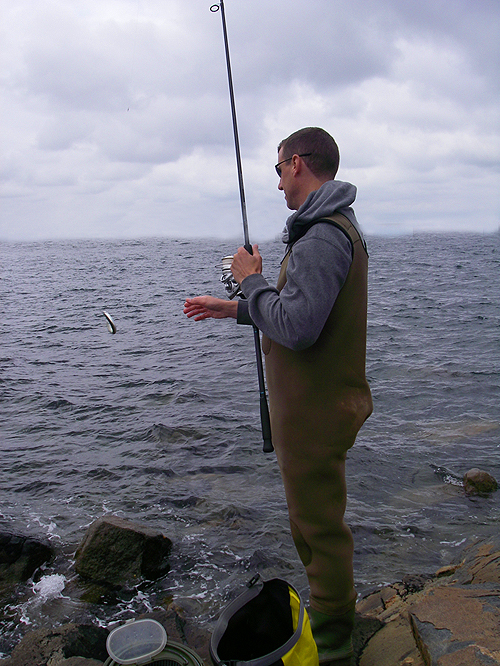 The tackle was virtually the same as the stuff I use for freelining live or dead mackerel bait - an eleven foot, 40-50g spinning rod, decent sized fixed spool reel loaded with braid, a trace of fluorocarbon or clear nylon mono and a 7/0 circle hook; so I had no problem adapting to the situation. 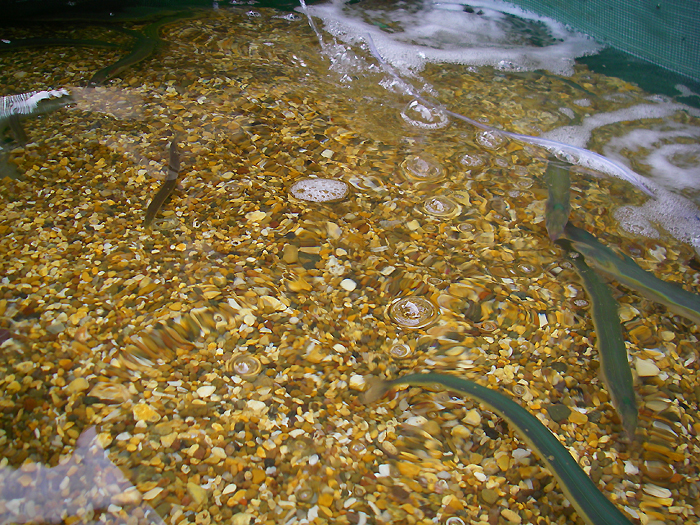 The big difference lay in the bait they used - it was live sandeel, live sandeel and live sandeel. The effort and consideration that these anglers have devoted to providing themselves with bass baits is (to me) astonishing. 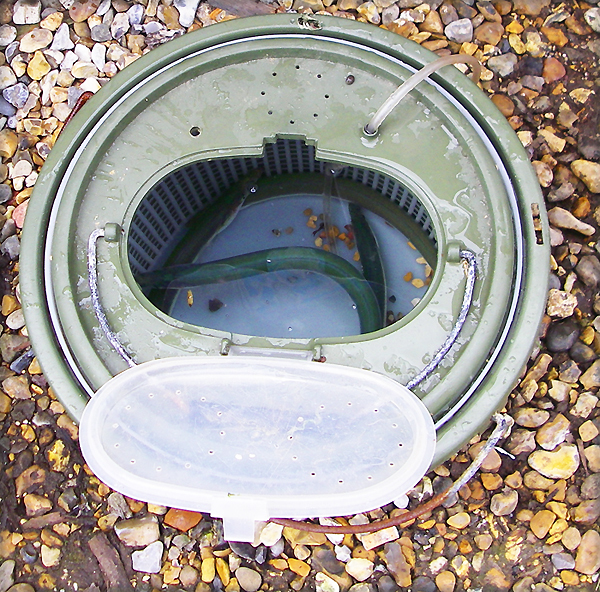 The sandeels are kept in large, cooled and aerated tanks of sea water, so that when they need bait it is simply a matter of transferring a few to a bucket fitted with a little battery-operated air pump and away they go. 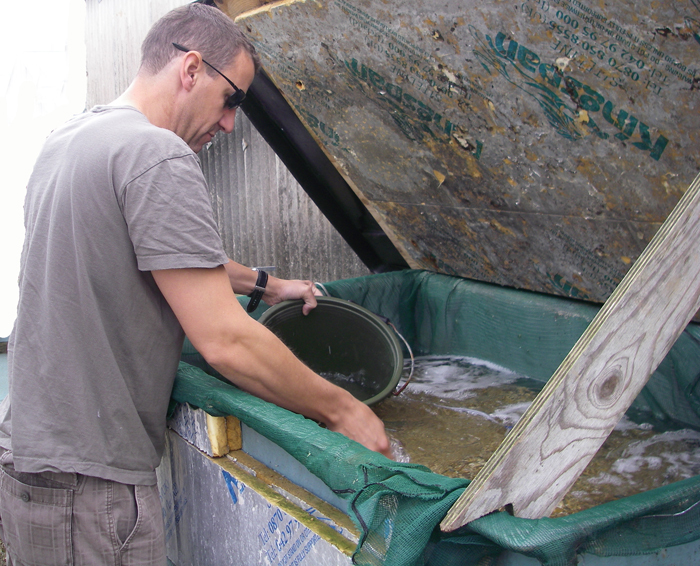 Andy says that it's worth changing the water fairly often while you're fishing but that is it. 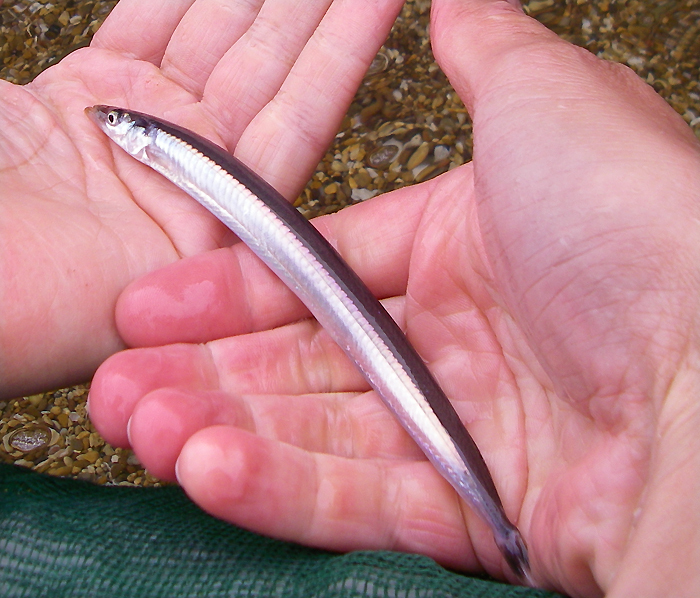 The sandeels, which range from large launce (Hyperoplus lanceolatus) over a foot long to six inch fish of several species, are hooked either at the head or the tail (depending on how you want to fish) and large ones can be cast considerable distances and will stay alive for quite a long time (dozens of casts). Depending on the mood of the bass and the nature of the ground the baits can be slowly retrieved or allowed to sink to the sea bed. Not surprisingly the GBASS anglers catch some cracking fish but, like any fishing, results are not guaranteed and my short session with Andy and his pal Mark was not blessed with success (unless you count a wrasse which followed and attacked one of the baits). I have to say that if I was living in the Channel Islands or if live sandeels were readily available to me over here I would be persuading my long suffering wife to allow me to set up a tank in the garage. 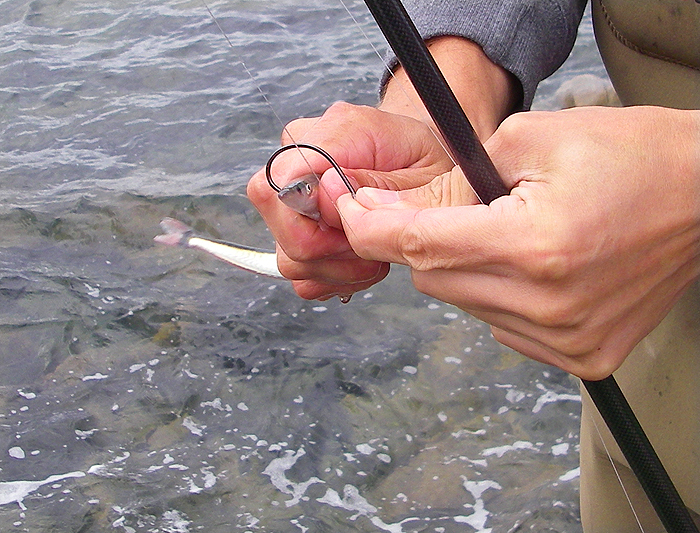 There's no doubt in my mind that in the hands of a skilled bass angler live sandeel is a very good bait. My trip was a real education and it would be nice to pay another visit to the wonderful Island of Guernsey to really get to grips with freelining sand eels. I wonder whether it might be a possibility next year? Life is just too short for all this fishing. Sorry I didn't get back to you earlier today, I went fishing!! My mate had a 4.6, I managed a schoolie and a 5.11, all on live sandeel and all catch and release. I'd go along with that. So there you have it - straight from the mouth of one who really knows! One of the lesser species.